Leigh Dodds has a nice post How Shall I Integrate Thee? Let Me Count the Ways... about different ways to integrate data. Apart from the suggestion that Leigh has been watching way too much Friends, there's much food for thought here. I suspect that "The one where we're describing the same thing" is the one I'll be making most use of. In Rethinking LSIDs versus HTTP URI I argued that most applications will use HTTP URIs, which makes them accessible, but not terribly useful as identifiers, the reason being that I think it is unlikely that people will reuse HTTP URIs ("The one where we share identifiers"). A good example is Connotea, which has its own URIs for each paper its users bookmark. I won't use these URIs as identifiers in my database (if only because if a user resolves them, they get taken to Connotea's web site, not mine). However, I will store any PubMed and DOI identifiers, so that somebody aggregating information from Connotea (say to retrieve user tags) and my database (say, to get links to sequences and specimens) can work out that the Connotea URI and my URI are talking about the same thing. Time for a rant. 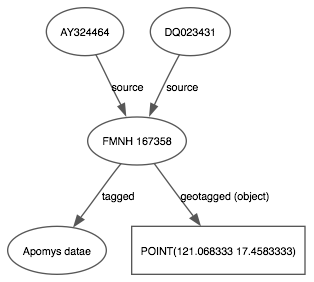 I spend a lot of time fussing with records from sources such as GenBank and DiGIR providers, trying to extract strings that might be identifiers, with a view to linking sequences to specimens (and thus to localities), sequences to publications, publications to GUIDs, etc. The goal is to be able to link all these resources together, so that I can go seamlessly from a phylogeny in TreeBASE to a locality on a map, and visa versa, of from a phylogeny for a parasite to that of its host, for example. Amen. I know I've moaned about this before (e.g., Damn DiGIR, and AMNH Dspace and Openurl), but it's just amazing what people put into databases. My current favourite is the junk that populates GenBank source records. This is where people provide information about the source of their sequence (e.g., the organism it came from, any voucher specimens, and the geographic locality of the source). All manner of junk ends up here. Spot the problem? Leaving aside the fact that somebody has to parse this and extract the latitude and longitude (hmm, which one is which, can I rely on latitude coming first, ah the second must be longitude because latitude is never > 90°), the co-ordinates are not in Australia. degrees latitude and longitude in format "d[d.dd] N|S d[dd.dd] W|E"
Not hugely different, but the ";" needs to be removed before parsing. What's worse, I can't assume people will follow GenBank guidelines about how to store data in these fields. What I'm really after are specimen codes, as these can potentially be linked to digital records served by natural history collections. But, once again all manner of variations end up in GenBank records. For example, specimens in the Field Museum can be referred to as Field Museum of Natural History 167358 (DQ023431) or as FMNH 167358 ( AY324464 ), and there are other variations I've come across as well. Furthermore, FMNH 167358 isn't enough by itself to retrieve a record from the Field Museum, I need to know the address of the DiGIR provider, and whether the specimen is a mammal or some other vertebrate (museum specimen codes are often not unique across the institution). In my opinion the single biggest failure of specimen digitisation efforts is the lack of a globally unique, resolvable identifier. Sure, it's coming, but in the meantime we have chaos. Spent the week in Portugal at the EDIT Future Trends of Taxonomy meeting, held at the View from cave, at the beach in front of the Hotel Tivoli Almansor, Carvoeiro. Pretty venue, and an interesting conference (for the sociology, if nothing else). What I did find fascinating was the local geology, especially what appear to be ancient rock pools several metres above the existing sea level. These can be seen around Algar Seco. 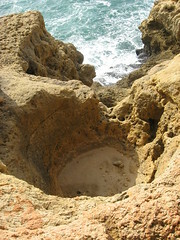 The pools are deep, often with smooth edges ground by rocks, some of which are still lying in the centre. Looks like the sea level here was once several metres higher. When I have a chance I should follow this up (e.g., doi:10.1016/j.geomorph.2006.04.014). Labels: "rock pools", "sea level"